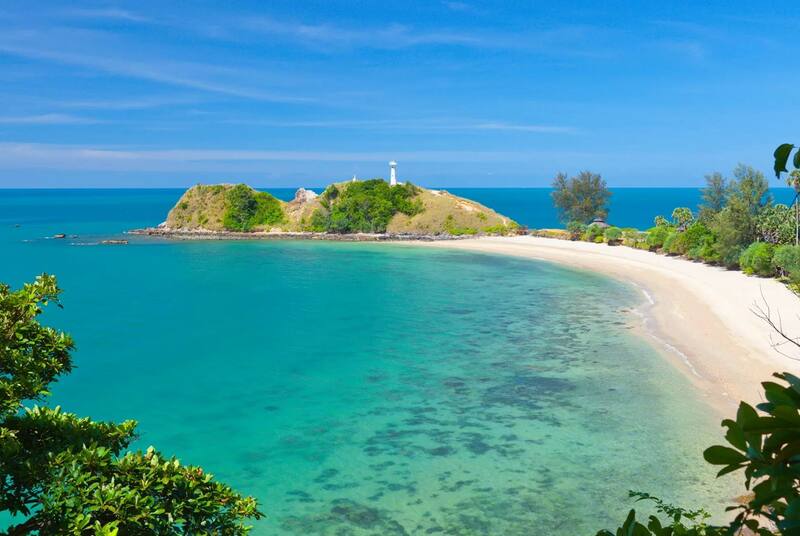 I’m a great fan of the beaches and islands of southern Thailand. While I love Phuket, Koh Phi Phi and Krabi on the west coast, in the past I’d always had a soft spot for the lesser developed east coast islands of Koh Samui and Koh Tao. These days they’re all bustling hives of activity with hotels and nightlife specifically catering to LGBTQ travelers. It’s great to see progress however sometimes you just want to leave the crowds behind. Finding an unspoiled peace of paradise isn’t always easy, often involving additional travel time and cost. I was thus delighted to recently discover the beautiful island of Koh Yao Noi, easily accessible from Phuket or Krabi and barely developed. Koh Yao Noi is a small island of fishermen and farmers located between Phuket and Krabi. The locals have purposely restricted development, which won them an award from Conservation International and National Geographic Traveler. We flew into Phuket early one morning and took a short taxi ride to the Bang Rong pier before boarding the boat for the picturesque 30 minute transfer to the island. A 10 minute drive delivered us to the magnificent Ani Villas, just in time for a fresh seafood lunch. Recently completed, Ani Villa is a fully serviced 10 bedroom luxury private estate, perfect for a group of friends or an intimate gay wedding. The dramatic view over the limestone islands of Phang Nga Bay is breathtaking, especially at sunset while lounging by the infinity pool, cocktail in hand. The suites, as you’d expect, are large, luxurious and extremely comfortable (mine even had an indoor swimming pool!). The centerpiece of the massive bathroom (which also featured ‘his and his’ sinks and a fun double shower) was a gorgeous freestanding bathtub, overlooking the private pool. There are so many spots to relax I simply floated around like a butterfly, occasionally landing on a lounge or bed, in a Jacuzzi or on a massage table at the spa. If you’re feeling more energetic, try the well-equipped gym or take a paddle board or kayak for a spin. Or my personal favorite (hours of entertainment) the super-fast water slide! One morning I set off on a mountain bike to explore the rest of the island. A quiet shady 18km road circles the island, weaving through forests and rice paddies. It was a relaxing ride (only one hill) filled with great photo opportunities of friendly locals, a vibrant local market and water buffalo lazing in the sun. At one point I took a side trail along a muddy dirt road to the beautiful (& totally empty) Yao Nua beach – well worth the effort. If you try this, make sure to take drinks as there are no shops. On the return journey I met a group of sizzling hot Australian guys who were visiting KYN Muay Thai, run by a world champion Muay Thai boxer. What better place to get fit than paradise? I wondered if I was the ‘only gay in the village/island’? Of course I wasn’t – I met a lovely Norwegian boxer (thanks Grindr). For the adventurous, the north of the island offers fabulous rock climbing. All hotels also arrange day trips to snorkel and explore the beautiful islands of Koh Phi Phi and Phang Nga bay. If you’re looking for a relaxing time away from crowds, shopping and partying, Koh Yao Noi is a perfect option (even as a side trip from Phuket). With authentic Thai rustic charm, delicious fresh seafood and spectacular views, you’ll be lulled into states of extreme relaxation that may even tempt you to extend your stay. I did! For a group or wedding, it doesn’t get much better than Ani Villa. If you’re traveling solo or as a couple, Six Senses offers 5 star luxury. Several other small resorts offer a range of accommodation options to suit various budgets.